Lots of muscles get tight when throwing, but below are some of the most important muscles, which if left unaddressed will create inconsistent throws, poor velocity, and can lead to injury. The Glutes i'm talking about externally rotate the hip. When the Glutes become tight, they limit the opposite motion: hip internal rotation. When hip internal rotation is lost, it places more strain on the rest of the kinetic chain, and likely creates the rest of these tight areas, listed below. Specifically, lost hip internal rotation is associated with 50% of SLAP tears (shoulder labrum) and GIRD (loss of shoulder internal rotation). 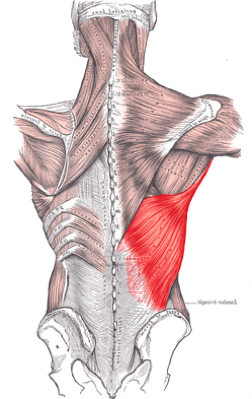 These are the Latissimus Dorsi (Lat), the Teres Major (which is a miniature version of the Lat), and the Subscapularis. Just like the hip, when the internal rotators get tight, the opposite motion is limited. That opposite motion is shoulder external rotation, or maximum lay back. Players who have greater amounts of external rotation are correlated with faster throwing velocities--so you don't want to lose it! When you do lose external rotation, the body still tries to achieve it ..and the inside of the elbow gets stretched. The UCL (ulnar collateral ligament) or Tommy John ligament gets stretched out and leads to lots of problems. These are the back side or posterior rotator cuff muscles; the Supraspinatus, Infraspinatus, Teres Minor...and likely the Posterior Deltoid. Just like the hip (can you see a theme here?) when the shoulder external rotators get tight, they limit shoulder internal rotation. People often throw around the term GIRD; Glenohumeral Internal Rotation Deficit, to describe this. GIRD is associated with significant shoulder injuries & elbow injuries...you name it..it can happen. Click here to Learn if you have these tightness' and more.